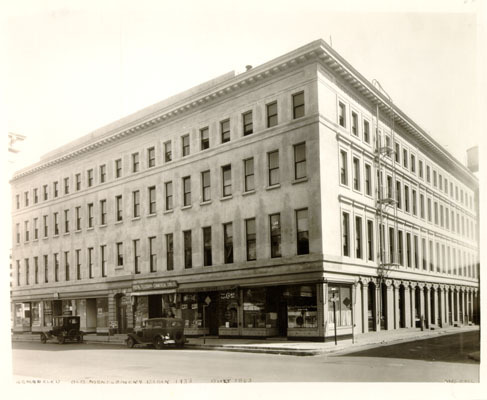 The Montgomery Block in 1933. The New Deal art programs in which Spohn participated produced a vast legacy of art that is still enjoyed today on public buildings and in museums, but the social milieu among the artists of the New Deal-sponsored programs rarely has been examined in detail. The present dire economic crisis invites comparison with the Great Depression and calls for a reexamination of the legacy of New Deal social programs. This paper examines the rich culture and personal histories of a community of artists living and working in the vicinity of Montgomery Street in San Francisco that were part of an artistic renaissance nourished by federal arts programs from 1933-1943. Like other New Deal programs that forged a new social contract with Americans and their government, the federal arts projects deeply affected the lives of the people they touched. Unprecedented government patronage not only enabled artists, writers, musicians, dancers and actors to productively survive the Depression, it encouraged collaboration, brought an array of free cultural programs to Americans for the first time, and forged a bond with the public through exhibitions, education programs and public performances. New Deal artists developed cooperative social and working relationships with one another and shared a sense of responsibility for bringing cultural programs to “Main Street” America rather than to elite patrons and collectors. An understanding of the broader economic crisis of the time and the government’s response to it is needed to provide the context for the role these artists played in a well-considered and comprehensive program of public policy. In the 1920s, the economy was booming, but there was a wide gap in income between rich and poor Americans, just as now. Then the economic collapse began with the 1929 Stock Market Crash. The ensuing Great Depression left millions unemployed. There was no social safety net — no bank deposit insurance, no unemployment insurance, no social security. Franklin Delano Roosevelt accepting the nomination of his party in 1932, pledged “a new deal for the American people.”(2) Later he would state, “The test of our progress is not whether we add more to the abundance of those who have much; it is whether we provide enough for those who have too little.”(3) This statement sums up the direction of the New Deal: Main Street before Wall Street. But then, just as now, the Right opposed Main Street progress. People may argue over statistics about what the New Deal accomplished,(4) but two things are needed to understand it clearly. First, that people who participated in or benefited from the New Deal tell the real, firsthand story, and second, that the New Deal’s physical legacy still surrounds us (mostly unrecognized) as buildings, bridges, roads, and public art — a visual landscape that we enjoy and depend on today. In the first Hundred Days of FDR’s Administration fifteen major pieces of legislation were passed to address the problems created by the economic collapse. (5) Among this so-called alphabet soup of programs was the Civilian Conservation Corps (CCC), ultimately employing 3.5 million unemployed youth and planting 3 billion trees. Another program gave long term mortgage loans(6) to some 1 million homeowners to prevent foreclosure. The Glass-Steagall Act separated commercial and investment banking and established the Federal Deposit Insurance Corporation (FDIC) to insure customers’ deposits in banks and thrift institutions up to $100,000. The Public Works Administration (PWA) built massive infrastructure projects, such as dams, bridges and schools. After the Hundred Days, a myriad of other federal programs was created. 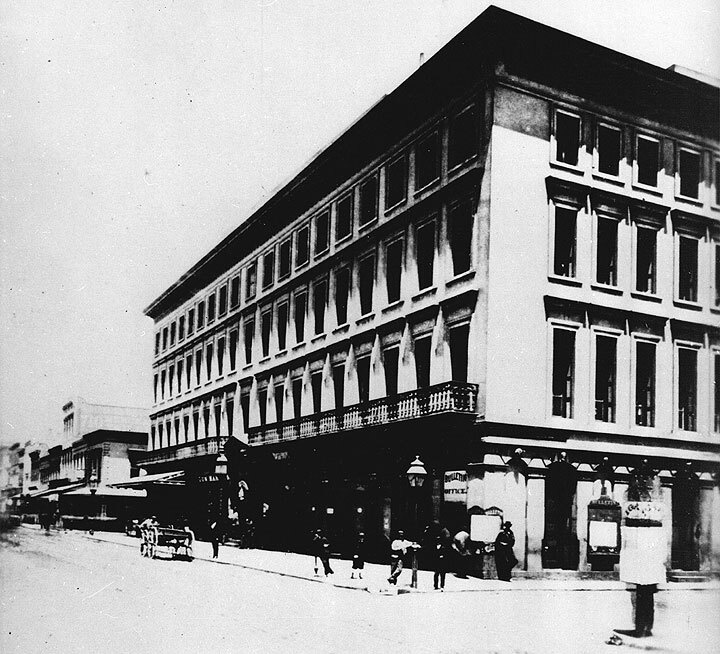 Because regulating corporate excesses was critical, the Securities and Exchange Commission (SEC) was established to oversee stock market trading. The Federal Communications Commission (FCC) was formed to maintain electronic communications in the public interest. Thousands of families were provided housing in both urban and rural areas. (7) One of these programs, the Farm Security Administration (FSA), also hired photographers, including Walker Evans, Dorothea Lange, Arthur Rothstein, Russell Lee, Gordon Parks and others to document the conditions of drought-stricken and financially ruined farm families. FDR outlined his program for post-World War II in his 1944 State of the Union Address. He proposed a “second Bill of Rights” that recognized inherent human rights including employment, housing, medical care and education. FDR died before he could implement his “economic bill of rights” proposal. (12) However, his New Deal programs did provide long-range public investment(13) which lifted communities all across the U.S. We are still benefitting from these infrastructure and social programs three quarters of a century later. 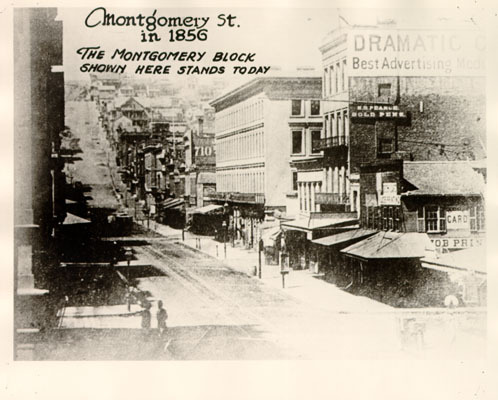 The Montgomery Block building seen here in 1856 stood where the Transamerica Pyramid stands today for more than century. 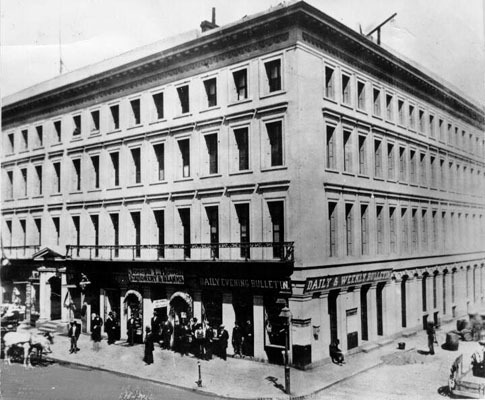 The Montgomery Block building in 1880. Some of the artists saw their efforts tied to grassroots activism. Artists in San Francisco organized to get work and linked their work initially to labor organizing efforts, particularly the 1934 San Francisco General Strike. Bernard Zakheim, Kenneth Rexroth, Frank Triest, Victor Arnautoff and Ralph Stackpole were influential in forming the Artists’ and Writers’ Union to pressure Washington to initiate a federal art project. (23) Their efforts resulted in the first New Deal mural project in the U.S. — Coit Tower on Telegraph Hill. (24) This project, the combined work of 26 artists and their assistants, took place during the General Strike. The artists could see the labor actions unfolding on the Embarcadero below. Two strikers were killed by the police in the heated struggle. At one point the artist’s union organized a picket line around the tower to protect their murals from a vigilante committee attack. The voices of New Deal artists who were part of the Monkey Block (found primarily in the mid-1960s oral histories of the Archives of American Art of the Smithsonian Institution) consistently depict the unique period of the 1930s and early 1940s and the experiences of working under government sponsorship. A common theme in these oral histories is the artists’ gratitude for the New Deal art programs that helped them to develop as artists, enabled them to form a supportive community, fostered their sense of responsibility to their public audience, and nurtured an American artistic renaissance. Herman Volz, WPA supervisor and muralist, described his efforts to organize the artists. The climax to the New Deal artistic endeavor in San Francisco was the building of the 1939 World’s Fair on Treasure Island, a PWA project. Officially titled the Golden Gate International Exposition, but also known as the “Pageant of the Pacific,” it brought artists together to embellish the fairgrounds. When the fair was extended into 1940, the Art in Action project brought Diego Rivera and the WPA artists in direct contact with the public. By December 1941, all that the fair had tried to accomplish by showcasing the cultural diversity and unity of the Pacific Basin came to a horrible end with the attack on Pearl Harbor. 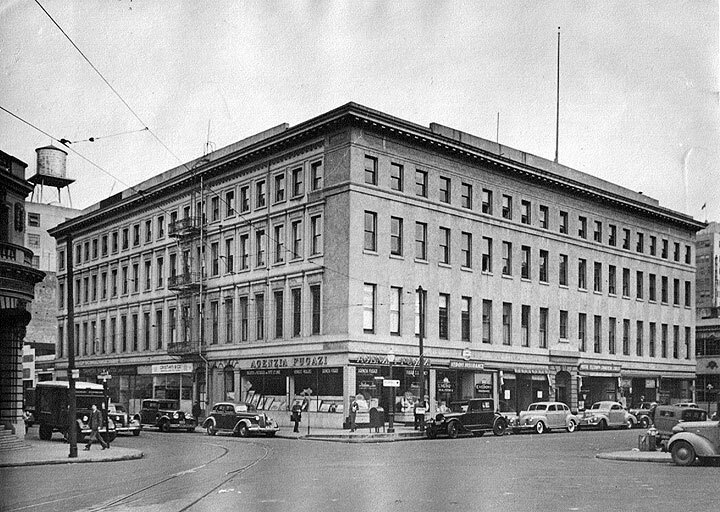 Lamentably, the lack of a strong preservation movement allowed the Montgomery Block building to be torn down two decades later in 1959. San Francisco poet Lawrence Ferlinghetti argued in 1998 “that North Beach… be officially protected as a "historic district", in the manner of the French Quarter in New Orleans, and thus shielded from commercial destruction such as was suffered by the classic old Montgomery Block building, the most famous literary and artistic structure in the West until it was replaced by the Transamerica Pyramid.”(44) However, it is probably fitting and somewhat ironic that the site that housed generations of San Francisco writers and artists came to be occupied by San Francisco’s tallest and most iconic building. Still very much in place is the essential infrastructure left by the New Deal. The true measure of a civilization is always more than its bricks and mortar, but its lasting cultural and artistic achievements. New Deal artists left a vast visual legacy of easel works, embellished buildings, sculpture and murals. The San Francisco Bay Area certainly received its share. The New Deal was clearly the result of the combination of intelligent and inspired leadership at the top and public discourse, enormous activism and unparalleled creativity at the grassroots. It established a new social contract that raised American middle-class living and cultural standards. Today we should ask the question, “Where did it go?”(47) Reflecting on the scope of New Deal programs shows how much the vast majority of ordinary Americans has lost, and how we could revive the movement toward greater social equity and economic democracy. And, perhaps foster another artistic renaissance as well. Harvey Smith, M.P.H. is President of the National New Deal Preservation Association and Advisor to the California’s Living New Deal Project. This paper has been presented at the Conference, “1935: The Reality and The Promise,” held at Hofstra University on April 7, 8, 9, 2011. All rights for publication in either printed or electronic format are strictly reserved by Hofstra University pending the publication of a representative selection of papers presented at the Conference. Special thanks to Mary McChesney, Rondal Partridge, Milton Hebald, Gertrude Goodrich, Beth Danysh, Julia Bergman, Ruth Zakheim, Masha Zakheim and Nathan Zakheim. Dedicated to the memory of Thomas Fleming, Toby Cole, Milt Wolff, Archie Green and Studs Terkel. Thanks to Gray Brechin and Susan Ives for their suggestions. 1. Oral history interview with Clay Spohn, 1964 Oct. 5 and 1965 Sept. 25, Archives of American Art, Smithsonian Institution. 2. Roosevelt, Franklin D. “Roosevelt’s Nomination Address,” Chicago, IL, July 2, 1932. 3. Roosevelt, Franklin D. “Second Inaugural Address,” January 20, 1937. 4. For a clear explanation of the economic impact of the New Deal, see Walker, Richard A. and Brechin, Gray, The Living New Deal: The Unsung Benefits of the New Deal for the United States and California, Institute for Research on Labor and Employment, University of California, Berkeley, Working Paper #220-10, August 1, 2010. 5. Alter, Jonathan. 2006. The Defining Moment: FDR’s Hundred Day and the Triumph of Hope. New York: Simon & Schuster, New York. 6. Refinancing was done through the Home Owners’ Loan Corporation (HOLC). 7. This was done under several agencies, including the Public Works Administration, US Housing Authority and Federal Housing Administration (FHA) in urban areas and through Homesteads, Resettlement Administration (RA) and Farm Security Administration (FSA) in rural areas. 8. Downey, Kirstin. 2009. The Woman Behind the New Deal: The Life of Frances Perkins, FDR’s Secretary of Labor and His Moral Conscience. New York: Doubleday. 9. Flynn, Kathy. 2008. The New Deal: A 75th Anniversary Celebration. Layton, UT: Gibbs Smith, Layton, UT. 10. The Section of Fine Arts of the Treasury Department (the Section) was established to decorate federal buildings by commissioning artists through a competitive process, and the Treasury Relief Art Project (TRAP) was established to decorate federal buildings by hiring artists on relief. 11. Taylor, Nick. 2008. American-Made - The Enduring Legacy of the WPA: When FDR Put the Nation to Work. New York: Bantam Books. 12. Sunstein, Cass. 2004. The Second Bill of Rights: FDR’s Unfinished Revolution & Why We Need It More Than Ever. New York: Basic Books. 13. Leighninger, Robert D. Jr. 2007. Long-Range Public Investment: The Forgotten Legacy of the New Deal. Columbia, SC: University of South Carolina Press. 14. Oral history interview with Clay Spohn, 1976 Jan. 9-Feb. 5, Archives of American Art, Smithsonian Institution. 15. Tussey Dan. No date. “Fireproof in SF,” Guidelines, Newsletter for San Francisco City Guides and Sponsors. Online – sfcityguides.org. 16. Jones, Idwal. 1951. Ark of Empire: San Francisco’s Montgomery Block. New York: Doubleday & Company. 17. Swope, Sally. 1984. The Montgomery Washington Tower: An Historical Site and its Artifacts. San Francisco: Swope Art Exhibition Services. 18. Rexroth, Kenneth. 1966. An Autobiographical Novel. New York: Doubleday & Company. p.365. 19. Ruth Cravath and Dorothy Wagner Puccinelli Cravat: Two San Francisco Artists and Their Conemporaries, 1920-1975, Regional Oral History Office, The Bancroft Library, University of California, Berkeley. 20. Goodrich, Gertrude. Telephone Interview, Jan. 30, 2011. 21. Hebald, Milton. Oral Interview, Jan. 9, 2011. 22. 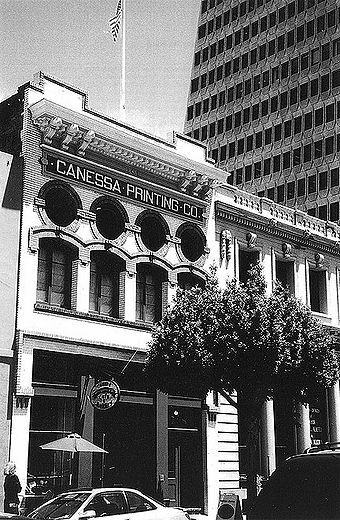 “History,” Canessa Gallery Artists Resource, Jackson Square, San Francisco. Online – canessagallery.wordpress.com. 23. Lee, Anthony W. 1999. Painting on the Left: Diego Rivera, Radical Politics, and San Francisco’s Public Murals. Berkeley: University of California Press. 24. Zakheim, Masha. 2009. Coit Tower, San Francisco: Its History and Art. San Francisco: Volcano Press. 25. Brechin, Gray. 1996. “Politics and Modernism: The Trial of the Rincon Annex Murals.” In Karlstrom, Paul J., On the Edge of America: California Modernist Art, 1900-1950. Berkeley: University of California Press. 26. See Freeman, Paul. 1992. The Rock Art Lithographs of Lala Eve Rivol. Novato, CA: LWL Consulting. This book recounts the incredible story of a young model, artist and resident of the Montgomery Block. 27. Oral history interview with Paul Carey and Stephanie Caloia, 1997 Oct. 26, Archives of American Art, Smithsonian Institution. 28. Oral history interview with Paul Carey, 1993 Dec. 3 and 28, Archives of American Art, Smithsonian Institution. 29. Oral history interview with Sargent Johnson, 1964 July 31, Archives of American Art, Smithsonian Institution. 30. Edith Hamlin: A California Artist, An Interview Conducted by Donald J. Hagerty, American Studies Program, UC Davis, 1981. 31. Oral history interview with Edith Hamlin and Dorothy Cravath, 1964 May 27, Archives of American Art, Smithsonian Institution. 32. Kingman, Dong and Kingman, Helena Kuo. 1980. Dong Kingman’s Watercolors. New York: Watson-Guptill Publications. p. 18. 33. Oral history interview with Dong Kingman, 1965 Jan 12, Archives of American Art, Smithsonian Institution. 34. Rondal Partridge, Dorothea Lange’s assistant and National Youth Administration photographer, visited the Montgomery Block area as a youth, but seemed to find the Black Cat Café a bit “intimidating.” He never entered, describing it as a “gloomy place.” Oral Interview, Jan. 5, 2011. 35. Oral history interview with John Saccaro and Terry St. John, 1974 April 30- Nov. 18, Archives of American Art, Smithsonian Institution. 36. Weatherwax, John M. 1930s. “The Queen of Montgomery Street,” manuscript. Archives of American Art, Smithsonian Institution. 37. Oral history interview with Emmy Lou Packard, 1964 May 11-12, Archives of American Art, Smithsonian Institution. 38. Oral history interview with Herman Volz, 1964 June 27, Archives of American Art, Smithsonian Institution. 39. Oral history interview with Herman Volz, 1964 June 27, Archives of American Art, Smithsonian Institution. 40. Oral history interview with Dorothea Lange, 1964 May 22, Archives of American Art, Smithsonian Institution. 41. Oral history interview with Helen Bruton, 1964 Dec. 4, Archives of American Art, Smithsonian Institution. 42. The government providing for people’s needs could raise the question how were these artistic programs, as well as all the other New Deal programs, paid for? Deficit spending enabled allocations for New Deal social, cultural and infrastructure projects. This spending was eventually paid for through tax revenue. It is worth remembering that carved into the granite façade of the Internal Revenue Service building in Washington, D.C. is the statement by Oliver Wendell Holmes, Jr., "Taxes are what we pay for civilized society." We, the American people, have paid for our schools, post office murals, libraries, parks and roads. Ultimately, reconsideration of the balance between progressive taxation and regressive taxation is the answer to the present dilemma of budget slashing, program defunding and the widest income gap since the late 1920s. 43. Oral history interview with Anton Refregier, 1964 Nov. 5, Archives of American Art, Smithsonian Institution. 44. Bufano, Beniamino Benvenuto. 1973. “For the Present We Are Busy” in Art for the Millions, edited by Francis V. O’Connor. Boston: New York Graphic Society, Boston. p.107-110. 45. Inaugural address delivered by Lawrence Ferlinghetti, San Francisco’s first Poet Laureate, at the San Francisco Public Library on Tuesday, October 13th, 1998. 46. New Deal murals were later to influence the development of the 1970s mural movement. See Knight, Cher Krause. 2008. Public Art: Theory, Practice and Populism. Malden, MA: Blackwell Publishing. p. 117-118. 47. Kuttner, Robert, “The Bubble Economy,” American Prospect, September 24, 2007. Krugman, Paul, “The Gramm Connection,” The New York Times, March 29, 2008. Stiglitz, Joseph E., “Capitalist Fools,” Vanity Fair, January 2009. Reich, Robert, “Too Big to Fail: Why The Big Banks Should be Broken Up, But Why The White House and Congress Don’t Want To,” robertreich.blogspot.com, October 25, 2009. 48. Today we have the choice between the comprehensive and progressive public policies of government regulation and Main Street programs, or the neo-liberal policies of tax cuts, trickle-down economics, de-regulation, and privatization and diminution of the public sector. To avoid getting lost among the dueling economists and public policy analysts in our zany contemporary political climate, current proposals can be measured by utilizing a “New Deal yardstick,” i.e., knowledge of the breadth and depth of the New Deal public policy.